Nominated alongside his MJF All-Stars band mate, saxophonist and NEA Jazz Master, James Moody, Mr. Blanchard won the prestigious award on February 8th in Los Angeles, garnering the first Grammy for Monterey Jazz Festival Records. The Grammy is the first major award for the two year-old Monterey Jazz Festival Records, an imprint of Concord Records. The label’s previous historic releases, including never-before-released live sets from Miles Davis, Dave Brubeck, Shirley Horn, Art Blakey, Thelonious Monk and more, have garnered high praise and stellar reviews from DownBeat, JazzTimes, the online magazine Slate, New York Sun, Wall Street Journal, Boston Globe and San Francisco Chronicle, to name a few. Monterey Jazz Festival Records has released thirteen records since August of 2007. Live at the 2007 Monterey Jazz Festival is the first non-archival release from MJFR, and was recorded in the Night Club on the Grounds of the Festival on September 23, 2007. Collectively known as the “Monterey Jazz Festival 50th Anniversary All-Stars,” this stellar group of three generations of jazz masters included James Moody on saxophone; Terence Blanchard on trumpet; Benny Green on piano; Nnenna Freelon on vocals; Derrick Hodge on bass; and Kendrick Scott on drums. The band made two appearances at MJF/50 in 2007 and appeared in a nationwide, 52-date tour across twenty-two states in the first quarter of 2008, performing for over 43,000 fans. “Monterey Jazz Festival Records is proud of Terence’s award and proud to present the best performances of yesterday, today, and tomorrow, captured live at the Monterey Jazz Festival,” said Jason Olaine, General Manager of Monterey Jazz Festival Records. “This all-star recording from 2007 marks only the first release in a series of new, MJF-exclusive, all-star collaborations that we hope bring joy to more than just the Monterey concertgoer.” The next Monterey Jazz Festival Records release will be a first-ever collaboration between bassist Dave Holland, pianist Gonzalo Rubalcaba, saxophonist Chris Potter, and drummer Eric Harland, who also recorded live at the Festival in 2007. The 52nd Monterey Jazz Festival will take place September 18 – 20, 2009 and will feature a roster of jazz legends and talented newcomers alike. 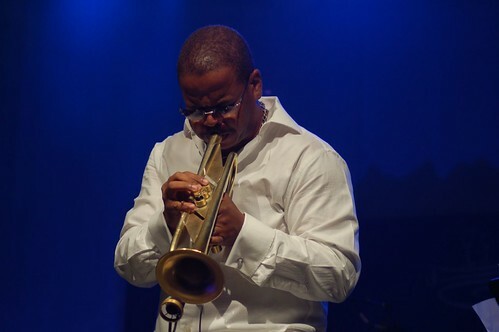 For MJF/52, the Festival has named as Artists-In-Residence the New Orleans-born trumpeter and multiple Grammy Award-winning and Pulitzer Prize recipient, Wynton Marsalis and the Jazz at Lincoln Center Orchestra. The full roster for the 52nd Monterey Jazz Festival will be announced on March 30, 2009; tickets will go on sale the same day. Updates can be found on the web at www.montereyjazzfestival.org. This entry was posted on Tuesday, February 10th, 2009 at 1:35 pm. It is filed under Monterey Jazz Festival, Music News/Info. You can follow any responses to this entry through the RSS 2.0 feed.